I just want to say to everyone on here that Rich from On Air Designs is one of the finest most honest and easy to work with people on the Internet. I can’t recommend him enough. He always has nice equipment and good prices and goes the extra mile for you. This is the way a business should conduct themselves. Thanks Rich for doing what you do! I can’t think of a time when I Have EVER had a better experience when buying online or anywhere else for that matter. Thanks for checking us out! We have some new pro audio boxes built – please check the shop page. Email me @ rikki2001@verizon.net with questions & custom build requests. Check the blog page often for the latest Testimonials on new products, or other cool stuff! I have nothing but great things to say about OnAirDesigns. In my quest to develop a way to improve audio quality and clarity with my communication radios, I searched and came upon this fine company located in the Southeastern PA. I inquired regarding the products advertised and was introduced to Rich, owner. After speaking with him, I decided to order the FX1 product and upon receiving it, I immediately noticed the quality and the time and thought placed into the design of this product. It is well constructed and has many options. The FX1 is a nifty solution for adding quality audio to my transceiver……. Not only am I happy with the product, I am even more delighted with the service and response from Rich to his customers. On several occasions, he has contacted me personally to offer his direction and guidance in setting up my rig. He cares deeply about his customers and I feel that his personal interaction with the customer is what makes his service so unique. ….. I feel I have made a personal friend in Rich as well. We are in the media industry, and in the future, I plan on utilizing OnAirDesigns to construct custom audio solutions and components for our corporate video/audio setups. We require quality construction, and OnAirDesigns is the company to go to. 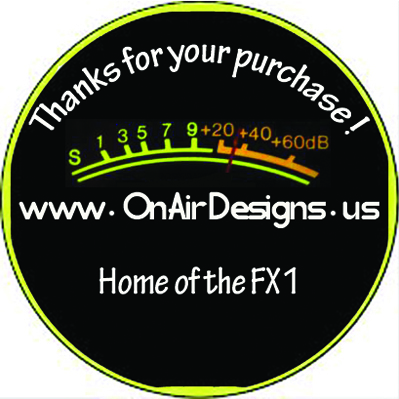 You can not go wrong with OnAirDesigns, and I personally recommend this company highly. Let me tell everyone you can not go wrong when you purchace from Rich! Works exactly as they should and are well build and nothing will rattle inside (like some others found on the internet). Very well built and I am a hooked customer. Thank You Rich…………. Rich has created such an amazing product! Very user friendly, as well as, his website. The product comes in pre-wired four pin and the new five pin and is completely plug and play functionality. The FX1 is simple to use because you simply plug in your PTT switch, which comes as a push button or foot pedal, plug in your audio input from signal processor(s), or mixer, and plug into the radio. This was the setup I needed, but is completely customizable. His customer service is amazing as well! I made an order for the FX1 and received an email the next morning with a tracking number without having to request it. He shipped it very promptly and I received the product very well packaged within a couple of days. This product works well, is shipped fully assembled (with instructions), and in my opinion is worth the price! Rich, keep up the great work and hope you expand to building these for ham radios as well. Wow, wish I had discovered this gem many moons ago… Hi, my name is George M, and stumbled upon the FX1 Combo while in search of improving my audio and modulation… well, lets face the facts…an amplifier is only as good as what you put into it..hence, you put in a good clean signal and you will get out a good clean amplified signal. The designer, Mr. Rich, really puts his heart and best efforts into the FX-1 and stands by his product. I seriously wish i had discovered the FX-1 much earlier…now, I simply cannot do without it. I would highly recommend it… if you need to be a cut above the rest. Brian here in eastern Iowa. I go by 481 Wally on 11 meters. I learned about the FX1 Looper from 777 Bulldog up there in central Maine. He directed me to Rich from OnAirDesigns.us. He makes these wonderful boxes. For years I’ve wanted to have HiFi equipment on my radios. This makes it so easy! Now I get good reports all the time and I stand out when shooting skip! I went with the Behringer equipment Rich suggests. I get no interference, just good, clean audio. So thank you Rich for an awesome product! And thank you Bulldog for directing me to Rich’s website! 73’s guys!